A warm smile and a friendly greeting are the key element in this fun volunteer position. 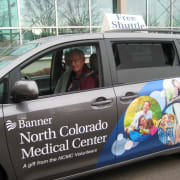 Join our Volunteer Courtsey Shuttle Team as they pick up guests and patients in our busy parking lot and help deliver them to their destination. A background screen and driving record screen are required but are paid for by the organization. A variety of shifts are available Monday through Fridays If your friendly and want to help, please contact us, we would love to share more with you! You must be at least 18 years of age and have a clean driving record. This is a great entry level position for college students or retired seniors.